Class meets for in-class group assignment on 2-27-2014. Students must be present in class to receive credit for this assignment. Class will be divided into groups. You will discuss and synthesize the essays you wrote and then form a group “Synthesis Document” that explains your consensus opinions and offers an explanation of alternative opinions. Dissenting opinions are not required, but if the group has no dissent, then opposing arguments must be anticipated and countered. This essay will be graded on a 1-10 scale, and will count for up to 10 points towards your participation grade. All group members will receive the same grade. All group member names must be in the document to receive credit. The document must be submitted electronically via CritViz. Your response should not exceed three pages. To be completed in class. Make sure to discuss within your group prior to writing the synthesis document. 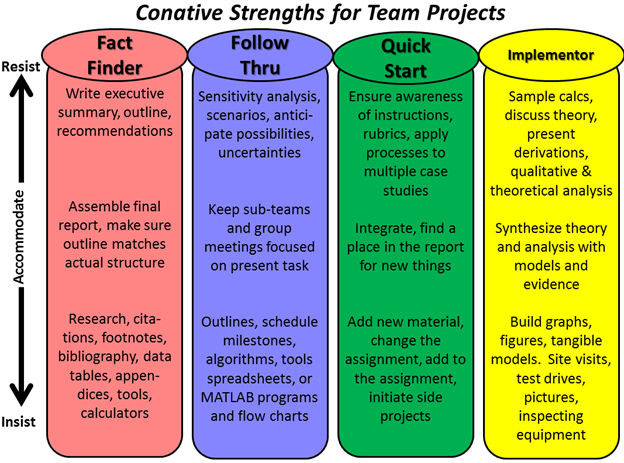 Think about strategies to complete the synthesis document before the class period ends. Background: You should be familiar with the Citicorp Tower case study based on reading and viewing the blog post and videos (http://wp.me/p2znJ3-3E). The purpose of this assignment is to encourage reflection on the application of engineering ethics in a case study, and to give students experience working in a collaborative team on a single document. Assignment: Your assignment is to write a collaborative group essay regarding the way in which LeMessurier handled the Citicorp Tower repairs as related to engineering ethics. 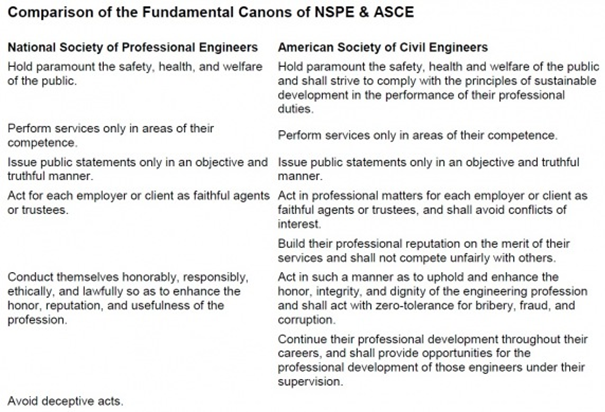 The Fundamental Canons of Engineering Ethics, as codified by the American Society of Civil Engineers (ASCE) and the National Society of Professional Engineers (NSPE), are tabulated below. In your opinion, did LeMessuier violate any of these canons in his handling of the Citicorp Tower repairs? William LeMessurier and his role in the Citicorp Tower controversy represent an example of when engineering ethics are put to the test. Explain whether or not LeMessurier adhered to the fundamental canons of engineering ethics in his handling of the Citicorp Tower repairs. Also justify why your position is better supported than possible dissenting opinions. That is, regardless of whether or not your group has dissent, you must explain the reasoning behind possible dissenting viewpoints, and why your position is superior. Style: In your essay, please do not use the first person (“I think…,” and “I felt…”). Provide detailed explanations and justifications for your opinions. Part of your professionalization is learning to synthesize multiple documents into a cohesive whole. Length: Your essay should not exceed 3 pages. Your essays will also be evaluated based on the criteria outlined below. Grading: Your individual essay grade will be out of 10 points and will count as a participation grade. Your synthesis document grade will be shared by your other group members, and will count as a participation grade out of 10 points. A student must be present in class on Thursday to receive credit for the synthesis document. Your individual essays will be graded separately from your group essays, but both will be graded along the same criteria. Authoritative. Demonstrates understanding of the Fundamental Canons applicable to the case study. Written with confidence in an appropriate and correct way (using correct terminology and incorporating references where needed for example) without alienating the reader. Attuned. Provides evidence of potential conflicts between personal and professional interests and how to handle these. Draws from personal or real life experiences. Dissent. Includes or anticipates dissenting / opposing opinions, explaining these respectfully, and explaining why the majority (or consensus) rejects this opinion. Concise. Conveys information within the limit provided (1 page for essay, 3 pages for synthesis document), minimizes redundancy and finds creative ways to express ideas quickly. Beyond. Exceptional content demonstrating high levels of creativity that may go beyond the bounds of the assignment. This could be original research, an extensive bibliography, incorporation of graphics, or reframing/repurposing the assignment. Resistant fact finder – Write summary opinions of the consensus and dissenting views. Prevent “paralysis by analysis”. Insistent fact finder – Document sources, add direct quotes. Exclude unsubstantiated or specious arguments. Resistant follow thru – Anticipate opposition, express uncertainties, reframe problem. Prevent repetition. Insistent follow thru – Ensure completion, compliance and proofread. Exclude extraneous arguments or information. Resistant quick start – Find precedent. Prevent loss of focus. Insistent quick start – Provoke debate and brainstorm. Prevent group think. Resistant implementor – Hypothesize, imagine, visualize. Prevent perfectionism. Insistent implementor – Role play, experiment, draw. Prevent loss of touch with reality. In addition to the specific roles identified above, general roles are highlighted in the chart below. Grades will be determined in a manner that greatly rewards areas in which you excel, while minimizing negative impacts of areas in which you do not. For example, if you demonstrate an excellent understanding of ethics relevant to the case study, but do not give adequate representation to dissenting opinions, your grade will be more strongly influenced by your discussion of ethics than your dissenting opinions. However, an ideal paper will excel in every category, and an “A” paper will teach us something new. Essays are expected to be complete when submitted, as well as submitted on-time. Due date and revisions: The due dates are in the CEE 300 Schedule. Write an individual response to the Fall2012 midterm exam question on LeMessurier. Post it to CritViz prior to 9:00A Thr 27 Feb (and bring a copy to class). Each student must upload their own individual response to CritViz regardless of their group. Share individual essays, write consensus and dissenting opinions and post on CritViz prior to 7P Thr 27 Feb. Consensus essays should be written as a group, but each student in the group must upload the final document to CritViz. Post jury document crits prior to 9:00A Tue 4 Mar. The initial grade you receive for your essay or for your synthesis document is not final, unless you are satisfied with it. Instead, you can view this as part of a conversation regarding your experience and your writing, culminating in re-submission of your essay for an attempt at improving your grade. Revisions must be accompanied by a cover letter detailing what feedback you received and what you changed as a result. Please contact Andrew Berardy (aberardy@asu.edu) for further details. Consult the revision guide for further information including revision deadlines. Do not begin revising your papers before reading the revision guide.